What’s better than granola where you choose the ingredients? Do you want sweet, filled with chocolate-covered espresso beans or gummy bears, or healthy, filled with dried fruit and nuts? The people behind MixMyGranola what you to decide for yourself…choose your granola base, add whatever ingredients you want, and they ship it to your door. We decided to give it a whirl and ordered two mixes. 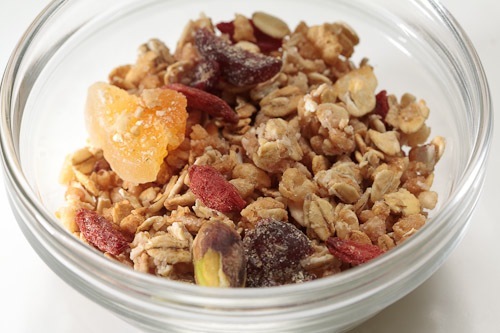 Luke’s mix consisted of low-fat granola (which includes almonds, cranberries and a hint of coconut), Goji berries, dried melon slices and pistachios. Carolyn’s mix consisted of French vanilla granola (which includes sliced almonds), dried raspberries, dried blueberries and dried papaya. 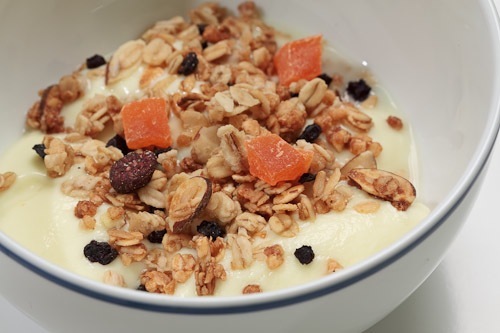 When we got our customized granola in the mail, we went straight out and bought our favorite Banilla yogurt. The granola consists of nice clusters of granola, not crumbly bits, and a good amount of mix-ins. Both of our concoctions were different and delicious…and perfect for eating by the handful or on top of yogurt. In these tough economic times, I think everyone is looking to get the most bang for their buck. How does the price of MixMyGranola compare to the store-bought granola? Our mixes came out to an average of $.56 per ounce ($.71 per ounce with shipping factored in). Our local Safeway store had plain granola for $.30 or $.45 per ounce, depending on brand, and not factoring in any sale. 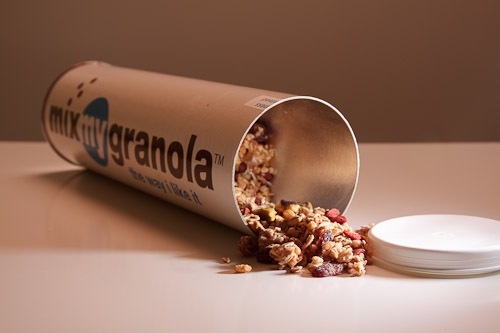 The granola comes in cool canisters, which would be good for kids to store Legos or whatever in. Mix My Granola says the packaging is 100 percent recyclable. Here’s an idea…what if they included a label/envelop to ship the canister back to the company (for free) and offered small amount off your next order for doing so? They could recycle it for future use, you’d have less canisters in your home and/or sent to your local recycling plant. Product stewardship, that’s all I’m sayin’. Bottom line…this is perfect for the granola-obsessed. It may be a little expensive to buy all the time, but it’s a fun treat.